Dubai, United Arab Emirates – 30th October 2017: Dubai Fitness Challenge (DFC) is bringing fitness to every resident and visitor thanks to free mobile fitness gyms popping up in 75 different spots across the city. Locations include malls such as The Dubai Mall, Mercato and Ibn Battuta, lifestyle destinations like City Walk and The Beach at JBR, as well as residential neighbourhoods including JLT, JVT and Al Barsha. The mobile fitness gyms add to the packed calendar of DFC activities and are designed to help maintain the momentum of the city-wide initiative that’s aimed at making Dubai one of the most active cities in the world by encouraging residents and visitors to commit to 30 minutes of daily activity for 30 days. At the ‘Mobile Gym’ pop-up facility, participants can personalise their own workout by making use of the extensive fitness equipment, including exercise bikes, cross trainers and more. For the adventurous, the ‘Mobile Urban’ facility offers adults and kids the chance to try skateboarding and parkour, while the ‘Mobile Fitness’facility offers 30-minute fitness classes guaranteed to help you work up a sweat. At each location, expert trainers from sports brand Decathlon are on hand to host fitness classes, demonstrate sports you may never have tried before and offer advice on keeping fit and healthy. 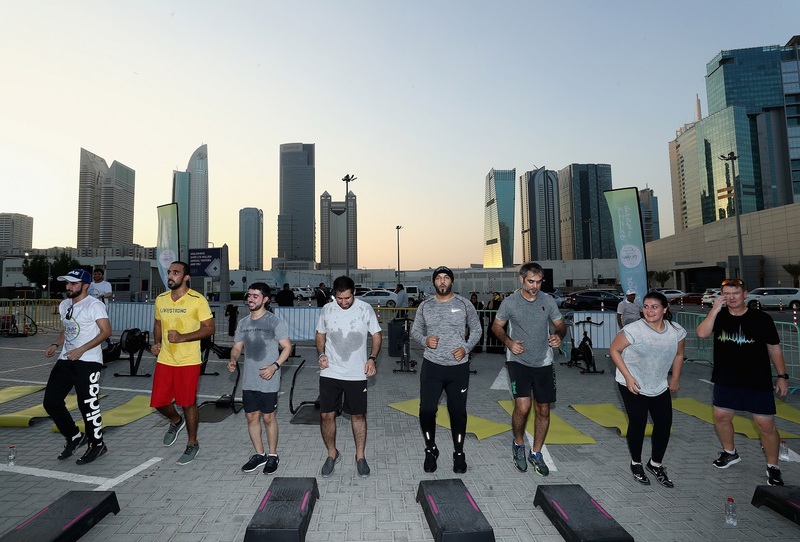 While stationed individually across the city for most of the month-long fitness initiative, the mobile gyms will congregate and join forces for the Burj Park Weekend Fitness Carnival on 10-11 November, offering participants the opportunity to try the full spectrum of sports and fitness activities in one convenient location. To find your nearest mobile fitness gym, visit www.dubaifitnesschallenge.com. As Dubai takes up the challenge, residents and visitors of all ages and fitness levels are encouraged to seize the opportunity to take positive steps towards a healthy lifestyle – not just for themselves, but also for family and friends. DFC has been created to motivate the people of Dubai to boost their physical activity and commit to 30 minutes of daily activity for 30 days. Running from 20 October to 18 November 2017, the Challenge encompasses all forms of activity – from beach cricket, cycling and football, to paddle boarding, team sports, walking and yoga, as well as everything in between. All are encouraged to participate individually or together with friends, family and colleagues, enjoying new and exciting ways to improve their fitness levels. Participants can track their performance on the DFC app.